Thinking of renting a holiday apartment with a complete stranger? Someone you’ve only ever met in cyberspace? If so, don’t read The House Swap because this dark and devious thriller will make you pause for thought. Caroline and her husband Francis have swapped houses for a week so that they can have some quality time together (patching up their marriage) while her mother looks after Eddie, their small son. A stranger who Caroline has only met online, is renting their Leeds city centre apartment, while they stay in the stranger’s Chiswick house. They’ve weathered the marital storms of the last two years in which they nearly broke up, so their relationship remains fragile. Caroline is anxious of being alone with Francis for seven straight days as she is unsure if their marriage is worth saving. Her husband Francis regularly attends Narcotics Anonymous after a dangerous addiction to prescription pills, and she convinces herself that she’s over her affair with Carl, a work colleague. However the rental-swap of 21 Everdene Avenue disturbs her. It’s not just the lack of personal possessions but little unsettling traces that she keeps finding makes her grow anxious. There are pink roses in the bathroom, an all too familiar CD, and a bottle of aftershave in one of the bedrooms that looks back to her past; or could it be that Caroline is simply unravelling? She strikes up an acquaintance with Amber, the woman at No 14, and they go out for coffee together. Amber is very knowledgeable about the avenue’s inhabitants and slowly Caroline begins, somewhat surreally, to see a physical resemblance between themselves. It is almost as if Amber were a younger version of herself, and, in fact, they have more in common than Caroline first thought. Meanwhile, “Kennedy” (their Leeds-house guest) may have plans other than escaping to Yorkshire in the house-swap. Kennedy’s house in Chiswick contains items that transforms Caroline’s growing unease into paranoia, for they appear related to something hidden, something dark. The novel dips in and out of 2012, 2013 and 2015 and written in first-person narrative from the perspectives of Caroline, Francis and Kennedy. Francis seemed unsympathetic with his pill addiction which led to him losing his job as a therapist and nearly causing a car accident. Caroline seemed rooted in the past as she appears to often reflect upon of her affair with Carl. However, the final twist was one that comes completely left-of-field, catching the reader off balance, so soon it’s a race against time to prevent the existential paranoia in Caroline’s mind to become a dangerous and tangible reality. 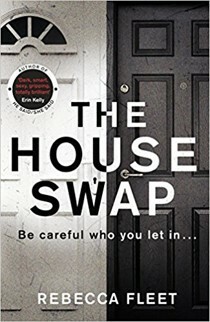 As psychological thrillers go, The House Swap is extraordinarily prescient - with the effects of AirBnB and the era of the anonymous online letting agent - and will hold the reader’s attention as tightly as their hands grip this book until the dénouement.